In this in-depth white paper research you'll follow along with me as I go through all the steps to buy a used Mercedes-Benz E-Class E350 sedan with full used car pricing analysis and I layout the best strategies we've been recommending for 20 years. You'll be a fly on the wall as I use the best of our years of car buying advice to make this purchase. There is quite a bit of information in this report, just like there is a lot of information and decision making for you parse through when buying a car, and we'll make it a breeze for you. Follow me as I walk you through the decision process of determining how old of a used car to buy, how to determine which cars are reliable, where you should start to shop, and how to shop, how much to pay, and how to haggle. You'll also see what happens as I perform several stress tests of our time-tested car buying strategies, by purposely violating some of our cardinal rules of car buying, and see what the results are. If you are going to buy a used car, how old should it be? After 19 years of wonderful service, my old 1998 Lexus SC300 sports coupe was finally ready to be sold or traded in. The old gray mare just wasn't what she used to be and it was getting time to say goodbye. I paid cash for it new in 1998 and amortized it down to nearly zero over 19 years, and had no car payment since 2001! I definitely got my money's worth out of that Lexus. So how old of a used car should you get? Not 19 years old, that is for sure. Your strategy is to find that sweet spot on the depreciation curve where the car has lost the steepest amount of value, but yet still has some warranty left on it. 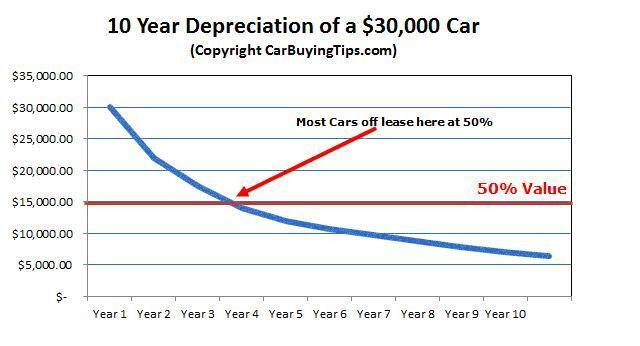 There is no clear one size fits all answer, but here is a good point to consider: Most cars depreciate about 50% or more the first 3 years, with the first 3 years of the depreciation curve being the steepest. Thus buying a three year old car typically as they roll off of a lease is a good time. Waiting any longer than 3 years is unlikely to yield any huge savings per year as the depreciation curve starts leveling off at this point. Waiting for a 4 or 5 year old car may not see as much of a drop in value as you would get from depreciating year 2 to year 3, and you also have no warranty left on the vehicle. Many premium new car manufacturers such as Audi, BMW, Lexus, Mercedes, and Porsche have 4 year warranties, so buying a 3 year old car leaves you with a year left on the warranty, depending on the in service date of the vehicle. We've even seen in the past warranties on certain Hyundai and Mitsubishi cars at 5 years. So now my decision was made, I want to get a 2014 vehicle, that is 3 years old, but can I afford it? I was prepared to pay up to $30,000, but was hoping to find something in the range of $15,000 to $25,000. Another good strategy I used is to lookup which cars are currently trending as losing the most value the first year. So I thought I'd find a current list and go looking through the bone pile for bargains like a bottom dweller showing up at the end of a garage sale to see what is left that might be of use. I did a Google search for "Cars That Lose Value The Fastest", and came up with a gold mine. From that list the $32,000 Nissan Leaf electric car was being dumped all over the place last year for $8,000, they couldn't give these things away. I spoke to a reporter in California who got an incredible bargain on one in the $8,000 range. Of course I had no interest in a Nissan Leaf, But this search was a great help to finding quickly depreciating cars. I was also surprised to find Mercedes C-Class on the list too as a rapidly depreciating car, because that is a premium brand. Apparently boatloads of people buy and lease the C-Class Mercedes because it is their lower price entry models that regular Joe Six Pack guys can afford. Then when the C-Class models finally roll off lease after 3 years, there's so many of them that the value drops, plus the cost to repair Mercedes with all the high tech gadgets can be quite costly. I was intrigued by this value drop and so the C-Class became my first good bargain hunting candidate for purchase. Other vehicles to buy bouncing around in my mind were Honda Accord, known for reliability, and possibly Toyota Camry. We also owned 2 Lexus vehicles, the other being a 2004 GX470 SUV, and we were very happy with Lexus over the years and quite open to consider them again. I also considered BMW 5 Series as well. Since I have picked off the bone pile from the island of depreciating cars which lose their value quickest, now it's time to search for cars with the most reliability, after all, no one wants to buy a used car that is likely to breakdown next week. For determining the reliability of used cars, I tend to browse over to the annually updated J.D. Power 2017 Dependability Ratings & Awards which is their breakdown of repair issues as reported by people who own 3-year-old vehicles, in this year's ratings list, the 2014 model year cars. On their list, the vehicle reliability metric looks at repair problems that owners of 2014 vehicles experienced over the last 12 months. This is a very valuable tool giving you some great insight because JD Power captures failures that people have been seeing the last 12 months, or starting 2 years into ownership. If a car had reliability issues, this is when they would bubble to the surface. This is the best gauge to determine which cars are reliable, giving us the best chances of scoring a car that will be as good to me as my old Lexus SC300 was which gave me no major problem until it was 10 years old, when the $700 door lock actuator failed. 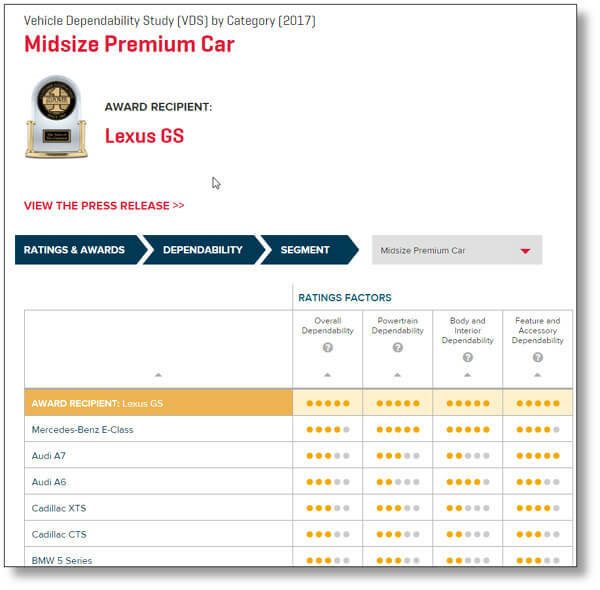 Looking through the JD Powers list I headed straight to the Mid-sized Premium Car category, and was not surprised at all to see the 2014 Lexus GS at the top of that reliability list. So now with the Lexus GS I had my second used car candidate to buy. Drilling down on that same category, I wanted to see which car makers were 2nd and 3rd, and discovered Mercedes-Benz E-Class in second place. I'll add that to my shopping cart for later too. Audi A7 and BMW 5 were also listed; I'll keep them in mind as I shop for my used car, so this reinforced my original pick of cars that I would consider. After reading old 2014 reviews of the Mercedes-Benz C-Class from Car & Driver and finding old review videos from 2014, I discovered that the reviewers liked the E-Class better, and so looking for a bit more room, prestige, and options, the C-class was out for me, despite the fact I could get into one for under $20,000 with some of our local dealers. The E-Class was now in contention for my driveway. The obvious sites to begin your search are of course eBay Motors, Craigslist, Cars.com, etc. I decided to start my search on TrueCar, which might surprise you, as most people equate them with new cars, but they also have a huge used car side and are just as adept at showing you used cars or sale, as most major dealer advertise their used cars there. I started my search for a 2014 Lexus GS and a 2014 Mercedes Benz E-Class E350 and they listed 100 of each within 75 miles of my house. For the Lexus I wanted that fancy new sport diamond honeycomb grill that the newer Lexus models are coming with, and no 2014 model had it so I ditched the idea of getting the Lexus GS. Apparently only more expensive later year GS models have that sport grill. Now I settled on my search for the Mercedes E-Class, 2nd on the JD Power list. There was nothing in my color on Craigslist. Many private used car dealerships actually enjoy most of their sales online, and often list their cars with TrueCar, eBay, Cars.com, etc. you'll be searching online for a used car and see the same car on several online classified sites, as the dealers are savvier at getting their cars in front of buyers in other states. Most car dealers buy their used cars at wholesale auto auctions like Manheim, closed to the public, snapping them up as they come off lease, or they buy from Carmax auctions, car rental agencies or get them from trade in deals. They will then condition the cars in their central hub garage and list them for sale all over the internet. When you buy a car from them, you just pay a shipper to transport the vehicle to you, or pick up in person. Don't' just limit your search to local dealers there could be a diamond in the rough in another state. Another ideal way for you to get a bargain price is to try to find a local auto broker or private car dealer who takes clients to the wholesale auction and bids on the car they want, and charges a fee for it. But this method of buying at a used car auction is risky and you have little time to view the car or have it checked out. You buy it, you own it, problems and all. All you can do is run a vehicle history report on it, and pray the seller discloses any previous car accidents. A few people I know over the last few years had been asking me about Off Lease Only, a regional used car dealership with lots in Orlando, Palm Beaches, Miami, Tampa and getting ready to open one within a couple of miles of my house. They sell mostly off lease vehicles often way below retail market price with no dealer fees, but many of their cars have mostly minor accidents reported in their CARFAX reports. A few people I know who have bought from Off Lease Only told me they got a good deal from them with no dealer fees, one of their big selling points, which intrigued me to look into it. There may be a similar type dealership in your area to consider, many of these types of dealers don't charge dealer fees, and advertise heavily on eBay and TrueCar, as well as their own web sites. At any given time Off Lease Only has 2500 or more cars listed online. They had about a dozen 2014 E-Class cars listed on their web site and on eBay, and their pricing is typically about $2000 to $5000 below the car dealer franchises so that woke me up, but not a single Off Lease Only dealer location had my Lunar Blue Metallic with tan interior that I preferred. They had black ones, white ones and gray ones all day long, but no blue, so unfortunately I could not buy from them, I had to keep searching. Too bad I was hoping to be able to report to others how my deal went, but they simply had no vehicle for me. I know we typically want to avoid accident vehicles, and many of you are not comfortable with cars that had been wrecked, some people are really squeamish and paranoid about it, but there are some circumstances where an accident vehicle is not all that bad. Many of the car dealers post the CARFAX report online for you to see, so if there is previous wreck, it usually shows up in the report. I like to search through the report to the detailed vehicle history section showing the accident and look to see if it indicates a major or minor accident, or multiple hits from cars, and look where it shows if the airbag was deployed. That is a good gauge of how serious the accident was in my opinion. Sometimes the vehicle history report will provide descriptive detail and state "Vehicle involved in rear end collision involving left rear impact with another vehicle. Left rear primarily damaged. Minor damage reported", this is what it said for the car I ended up buying. I have no problem with that, but I would avoid buying the car if the Carfax report mentions structural damage, as even Carfax warns you that structural damage may impact vehicle safety and reliability. 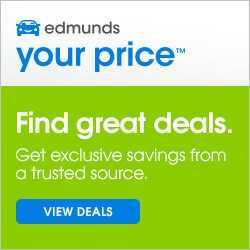 Many people like to use Kelley Blue Book (KBB) or NADA guides or even Edmund's to determine what the pricing should be for a used car. But sometimes you walk into a dealer with KBB, and they say "We only use NADA pricing." So other times you walk in with NADA guides and they say "We only use Kelley Blue Book pricing", so what is the most accurate source for car pricing? You need to be able to shut down their sales talk with real actionable current car market Intelligence based on real deals happening today which no one can argue with. My classic method for determining the current value of a used car is to search eBay Motors for your car, and locate one with similar mileage, condition, and installed options, and on the left side navigation of eBay check off "Completed Items", which filters down the results list to just the cars that actually sold, and this is your accurate and true market value, for both private sellers and used car dealers. No one can argue with these numbers, as they are actual sales that happened in recent days, including from car dealers, in fact mostly from dealers. If you expect the car dealer to lower the selling price of the car, you have to give them a good reason to do so. That reason comes in the form of competitive pricing from other car dealers, Craigslist ads, and completed sales on eBay. Make printouts and bring them with you to make your case, and let the air out of their lofty asking price if it is too high. If you find a car you like at one dealer's web site do a little recon and make sure the vehicle history report is clean. You might like to also hunt for other car dealer listings for the same car where the asking price is lower and print them out. Then you'll be able to give them a reason to lower the price. Many dealers list the Autocheck or Carfax vehicle history reports online for the car you are looking at. If they don't have one, or if you are looking at private party used cars, you can pay for your VIN reports directly from the two report companies. Use issues like multiple owners, accidents, and other bad items to chisel the selling price down. I also researched the value of my current car to see if it's worth trying to trade it in or sell myself. My Lexus SC300 was basically a 19 year old beater, and Kelley Blue Book's online "Check My Car's Value" feature said it was worth $2400 for Trade-In if… and that's a mighty big if folks… if it is in fair condition. KBB also showed my value at $3200 for Private Sale to a regular person in fair condition. I was coming to terms with the grim reality that it would be divine intervention if I got $1,000 for it on trade. But my car was in poor condition, and KBB does not even have a category for used car prices in poor condition. Now I had to face the fact that I had a car with too many issues for me to sell on eBay or Craigslist. No matter how many issues and needed repairs I disclose, with my luck someone would buy it and then accuse me of not disclosing something and file complaints against me on eBay. Not for me, as much as we always sound off that you should sell your current car yourself and I have sold many cars on eBay, this was one scenario where you better just let the dealer take it. We normally suggest you sell your old car yourself and get $3000 or more over trading it in, but this was one below-$3000 pig you could not put any lipstick on. I had no choice but to trade it in, or offer it up to the salvage guys for $500 and no, I was not going to donate it and have some poor person be stuck with a money pit car they cannot afford to dump thousands of dollars into. I figured a used car dealer would offer me a mini deal – usually the $500 minimum and they'd either scrap it or dump it on the wholesale auctions. If I had a 3-car garage, I would have sold the parts off my SC300 one at a time on eBay and made a fortune. The instrument cluster alone could fetch $500. The doors could sell for hundreds also, the power window motors and door lock actuators could go for a few hundred each. I tell people all the time to take their car over to Carmax, where they give it a thorough look over and print out their pricing analysis. They give you a printout with a no obligation offer to buy your car good for 7 days and they give a check on the spot if you sell them your car. You can still sell them your used car without buying another car from them. 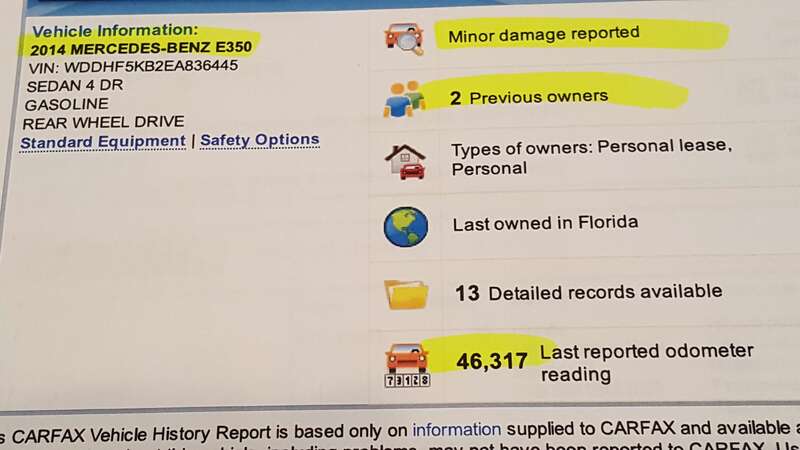 Their printout is a great gauge to see what dealers think your car is worth and is a good piece of intel to put into The Folder when you head into dealers, to keep them all aligned. If no other dealer gives you as good an offer, you can either sell your car yourself or sell it to Carmax. Since TrueCar was showing me 2 similar Lunar Blue Metallic 2014 Mercedes E-Class cars that I wanted to see both within a mile fo each other, I printed them out and headed off to the dealers. I went in on my lunch break. My strategy was to get in, buy the car, do the trade-in, sign the paperwork and drive out by 1 PM with my car. Simple plan right? In and out, no one gets hurt. Boy was I wrong. Remember I mentioned I purposely violated some of our rules of car buying? This is one of our cardinal rules here at CarBuyingTips.com. We've been warning people for years, especially with new cars, not to let the dealer you are sitting in offer to have your car shipped from another local dealer. Too many buyers in the past have complained about sudden increases in price, lies about what options are on the car coming from the other dealer, or there is damage, or it comes in with the wrong color, or some option is missing. More often than not it does not end well for you. Also with new cars, the holdback stays with the original dealer so you could end up paying $700 more. Go to the car dealer that actually has the car you want! If your dealer does not have the car you want, then go to the dealer that does have it by searching the local inventory on their web sites. I headed into our local Mercedes-Benz dealer who is an AutoNation dealership, looking for one of the 2 cars I saw on TrueCar. My printout was from Sunday and I went in on Thursday but the car was gone, and no other 2014 used E-Class models on their lot, I should have gone in on Monday. So there went my one hour in and out dream after searching the lot and waiting in vain while the salesman checked his inventory. 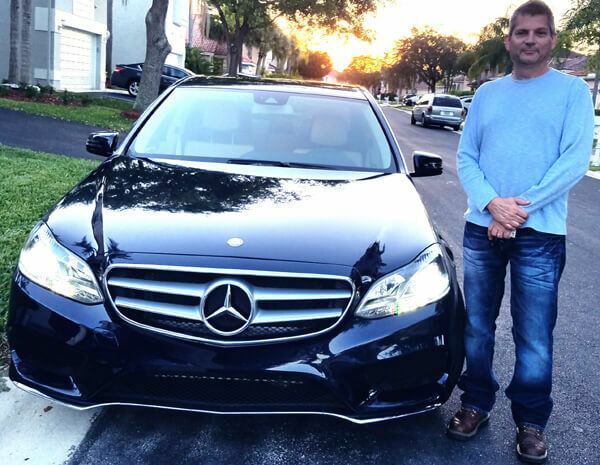 He then looked on the AutoNation network and found a beauty of a 2014 E-Class that matched all my criteria for $27,200 and showed me the Carfax report of one of the best qualified pre-owned cars I had ever seen, available at another Mercedes-Benz dealership 25 miles south of us, that he said could be transported up here in an hour. Was I really going to let Dealer A try to locate my car from Dealer B? This E-Class was a beauty, only 30,000 miles, which is low considering the industry standard of 15,000 miles per year, which would normally be 45,000 miles. The car also had only one owner, no accidents, Carfax certified "Well Maintained – Regular Oil Changes" which only 5% of the cars achieve this certification. If that wasn't enough to make you want to sign, this car had also passed though the stringent Mercedes Certified Pre-Owned (CPO) process that checks 165 items on the car. Since it passed that filter, this Mercedes CPO vehicle came with an additional 1 year extended warranty at the end of the standard manufacturer's warranty, plus roadside assistance. This car was quite the catch; I could not believe it was going to be mine. Shut up and take my money! Because AutoNation is a no-haggle dealership, their price is final, unless they get desperate maybe and you walk out and later on they decide they really want your business. I also dislike the fact that they charge big fees for electronic title and $700 dealer fees. In my opinion, when you hear dealers say "No-Haggle" it really means shut up and pay the fees. I was at a fork in the road. Do I take this car for $27,200 or keep looking with some of the other independent dealers that don't charge dealer fees, and their asking prices are $3000 less with maybe a minor accident in the car's history but I can't find the Lunar Blue. I decided this car was too good to pass up and it was worth getting that extra one year free warranty (translation, warranty built into the higher price) and it's a CPO vehicle too. We started signing all the papers and the sales manager of the Mercedes dealership came in to congratulate me. Another hour goes by and we're not hearing anything from the other Mercedes dealership across town in regards to the status of my Mercedes E-Class and where it is. I texted the online listing for the car to my daughter and told her this is the car we are buying. She responded back with total excitement. After 2 hours go by, I'm starting to get miffed because I could have gotten back into my car at noon and driven a half hour across town to the other Mercedes dealer and gotten an answer. Both my salesman and the sales manager were calling the other dealer, texting people, emailing them, trying to get an answer out of anyone down there. You can see the painful reminder I was served with here by violating one of our most important rules of car buying. Finally after 3 hours, the Mercedes Sales manager lowered the boom on me and informed me that the other Mercedes dealer had already sold that car, they don't know why it was still showing up in inventory. My failure to launch here shows I am a prime example why you don't let Dealer A try to get a car from Dealer B, now I see how many others before have suffered. The Mercedes dealer tried to accommodate me as best as they good, they kept checking the AutoNatiion network, but found nothing, and ended up offering to give me a break on a 2017 E-Class manager's special that had 1500 miles on it, but the price would still be way too much, and not far enough down the depreciation curve for me. So demoralized after 3 ½ hours of futility and still no car, I had no choice but to leave empty handed. I was upset to leave empty handed after all those hours and the poor sales person was upset as well, missing out on a sale after all that work. Next I headed over to the JM Lexus preowned lot around the corner, which had my second round draft pick to buy the Mercedes, and sure enough it was sitting out front and center up by the road in one of their 3 main high visibility marquee spots, for sale at $29,335, around $2,000 more than the other E-Class at the Mercedes dealer around the corner. Come to papa! This would be an ironic and befitting end to my relationship with my old Lexus SC300, as I had bought her brand new in 1998 just across the street at the JM Lexus new car lot. How interesting it would be to have her end up right back in the hands of the same Lexus dealer nearly 20 years later. I had already seen the Carfax report for this 2014 E-Class on JM's web site and knew this car had a minor accident in its history, plus it had 2 previous owners. But wow this car was immaculate, and perfectly clean inside not a mark or scratch. I don't mind a minor accident, and the report also showed no air bag deployment. This could be the one! At JM Lexus, I took a test drive with the salesman and he was boasting how good this E-Class car is, how all their cars have perfect Carfax reports, and bragged that it's probably been over a year since they had a used car with an accident on the Carfax report. I just chuckled inside, because I already knew before I step foot into this Lexus dealer that the Mercedes I was driving had been in a minor accident, and was eagerly waiting to see the shocked look on his face when he pulls up the Carfax on it. Knowing this type of intel is crucial to haggling the selling price down. I couldn't wait! It was amusing to me how in the office the salesman slides over the paperwork for me to sign with that full price of $29,337, plus a price gouging electronic filing fee of $250, and a dealer service fee of $800. This means they are really asking almost $30,500 for this car. I slid it back to him and said he was way off base, especially compared to the E-Class I was considering around the corner at Mercedes for $27,200. History has shown us that retail used car dealers typically come down $1500 to $3,000 on their inflated starting price to make it look like you're getting a bargain, so I told him they needed to be around $26,000 if they wanted me to take this car, because all the other dealers were asking far less than him, and I pulled out of The Folder, all my printouts from Truecar, showing all the dealers asking between $22,000 to $26,000 for this car, and many were charging no dealer fee. I was swinging for the fences on this one. The salesman goes to his manager for 10 minutes or so and I'm shaking my head, I can't believe I've been at this 5 hours already today and still no car, but I'm on the cusp of a great deal. He comes back and said the manager was generous and took off $749, so now the new window selling price is $28,588. I'm still not impressed; I'm not going to Disney world with the savings here. They have only had this car a few days so they are not really ready to let the car slip out at a lower price yet. Used car dealers often like to compare the asking price of their car to some fictitious overpriced retail value that most dealers don't really charge. Their job is to make you think they are discounting the price when in fact it's much more than their competitors and private party sales. It's like department store mattress and TV pricing, they show you how much you're saving off the suggested retail price that no store ever sells at to begin with in order to make you think you're getting special pricing. The AutoNation Mercedes dealer used this sales tactic as did JM Lexus, they all do it, it is just business so they can prove to you that their price is a bargain, a discount off the "market value". Using this tactic of comparing against unrealistically high market values, the AutoNation Mercedes dealer showed me a report on their car with a Kelley Blue Book reference value of $30,777, thus trying to make me think that with a selling price of $27,299, I was saving $3478 off the "retail value", all the while the other local dealers were only asking $22,000 to $26,000. JM Lexus also tried to justify their higher price by showing me an elaborate PureCars Pricing Report on my Mercedes, showing that their original offer to me was at a discount of $2307 below "market average", whatever that vague metric is. The pen is mightier than the sword and they use these subtle but powerful weapons against you, so you need to be ready to shoot holes in it and make them seem invalid. The Lexus sales people also tried to justify their higher selling price by telling me the car had AMG wheels, whereas the other model I looked at around the corner with Mercedes did not have AMG wheels. Big whoop, not a huge value add in the least, as option code 795, i.e. 18" AMG Wheels adds only $500 to a new Mercedes, not worth paying thousands more for a used car that has them. Now you can see clearly why it pays to know your intel on the car. 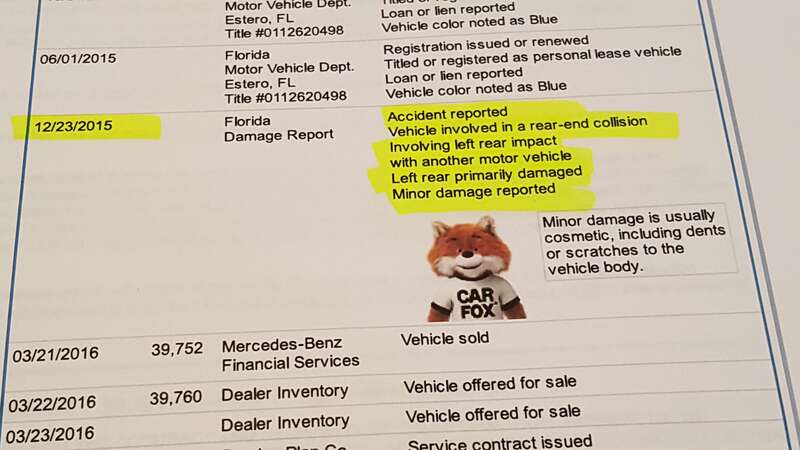 As the JM Lexus salesman started to print out the Carfax report, he was caught totally off guard when he was slapped upside the face by the fact that the report showed the car was in a previous wreck, after he just got done bragging to me that all their cars are accident free. That's when I swung for the fence and told them "you guys don't have a leg to stand on here to sell it for more than the price that the Mercedes dealer was asking for a far superior car than the one you are offering me for sale." I let the air out of the Lexus dealer's "our car is better" balloon by stating that their Mercedes has 3 strikes against them, number one it has 46,317 miles, so it's not under mileage for the model year, and two, it has an accident on the Carfax report, and three, there were 2 previous owners. Here's where I do my mic drop! They knew I was right, and I had blindsided them with info that they were not expecting at 6 PM at night after a long day. Also I confronted the salesman and his manager about their claims of this being a Lexus certified vehicle and told them there is no way a previously wrecked car could be Lexus certified. This is when they clarified that I was correct this was not a full blown Lexus "L/Certified vehicle", it was a "JM Lexus Certified" vehicle, a very subtle difference in nomenclature that will trick your brain into thinking you're getting cream of the crop when you in fact are not getting it. It's like fudging on your resume to make interviewers think you have more accomplishments than you really have. Your brain focuses on that magical word "Certified". A true L/Certified car is the Lexus corporate official version of a certified Pre-Owned vehicle, and is similar to a Mercedes CPO; with over 160 inspection points. But the Lexus extended warranty benefit is superior because they give you 2 extended years as opposed to Mercedes with only one extra year of warranty coverage, along with 24 hour roadside assistance. Certified Pre-Owned cars are a marketing excuse to upsell car buyers into costly " included benefits"
With the Lexus L/Certified vehicles, you also get a "complimentary" scheduled maintenance plan with pre-paid maintenance benefits. But don't be fooled, no one gives you anything for free; the cost is built into the higher price of buying the Certified Pre-owned cars. It's just another marketing ploy car dealers use to upsell you into more expensive extras while pulling the wool over your eyes. Sure the CPO cars are great, no doubt about it, but know where you stand; no one is giving you anything free; you are paying thousands extra for costly benefits stuffed into the deal. You probably had no idea you were actually paying for these built-in extras, this really is car marketing at its finest, as they convince you that you are getting something for free, when you are actually paying for it, $3000 more on average than other dealers. That "certified" nomenclature they used at JM Lexus seemed very inflated to me, like it is struggling to be something it isn't, it's like some watered down version of the real L/Certified, like going to the old Mikasa outlet stores and buying an irregular factory reject coffee mug for less. So JM Lexus has invented their own category of certified cars that are still good cars, but they are not quite good enough to be fully Lexus L/Certified, so you don't get the extra 2 year warranty. You get 90 days instead, ho hum. By comparison, at CarMax, all their used cars are CarMax Quality Certified and come with a 30-Day Limited Warranty, and some states it is up to 90 days. I have known JM to be a reliable dealer and the car was in great shape but bottom line was it was no Jack Kennedy; the first E-Class I saw at the Mercedes dealer earlier in the day was a better candidate and was cheaper too. Lexus needed to come back down to earth a bit on their price, and I told them so. Anyway, back to my walk-off home run. After I lowered the boom on the Lexus sales manager with all the wild pitches I had from the data in The Folder, they finally lowered their price another thousand and countered back to me with an offer for me to purchase my 2014 Mercedes E-Class E350 for $27,591, almost a full $2000 off their original offer to me. Many of you might think wow this is an awesome price, but keep in mind that it is still $2,000 more than other private dealers were selling this same car for. But yes this was a great car, and I know JM Lexus who is supposed to be the #1 Lexus dealer in the U.S. will give me top notch service as they have for 19 years with 2 other cars we purchased from them. At this point with their final offer I'm almost at the same price as the previous Mercedes dealer around the corner, and this E-Class at Lexus I was able to test drive and inspect it, see it in person, and I'm at the dealer who actually has the car in stock. It is fully loaded with AMG wheels, Navigation, Keyless Go, Moon Roof, Bluetooth, Sport Package, kick swipe hands free trunk open feature, massaging driver's seat, everything! No one else had a blue one up for sale, this Lunar Blue Metallic is a very rare one to find in stock so I accepted their offer. We have warned consumers for years about the dealer prep fees and they are creeping up now to $800 or more and $250-$900 for electronic title fees. We've heard that it costs maybe $15 per vehicle to have a third party company automatically reach into the dealer's CRM system and handle the electronic filing, yet one local Toyota dealer charges a whopping $900. Some dealers have the nerve to charge you $400 or more for Nitrogen in the tires. Here in Florida price gouging is illegal, if you sell a bag of ice for $10 after a hurricane, you get arrested. So why are car dealers allowed to get away with this? I normally tell people to walk away when they see these fees, go home and sleep on it, and see if the dealer calls you back to lower the fees. Some people are successful, but many dealers are sticklers about charging this fee and you simply can't get out of it, unless every car buyer refuses to buy a cart hen they might cave in. Here in the Southeast 5 states when buying a new Toyota it's nearly impossible to get out of that Southeast Toyota admin fee charged on every car. Since our inception in 1998, we have been warning consumers that the cardinal rule of buying used cars is that you must get a vehicle history report and you must have a trusted mechanic put the car up on a lift or else do not buy that uaed car. These 2 very important tasks are your last line of defense in filtering out a bad car, and avoiding a lemon. Consumers who fail to do this usually run into trouble. I purposely avoided having a mechanic check out the car first to see what would happen. Over the years we've heard from car buyers who bought a used car without doing these checks and almost every time, a major engine or transmission failure occurs within one to three weeks of the purchase, now they are dead in the water, can't afford to fix it, and the dealer will do nothing, pointing out that they bought the car as-is with no warranty. Then the buyer later runs a vehicle history report and discovers the car was wrecked. Why don't car buyers ever move to take these steps to protect themselves before buying the car? Had their mechanic checked out the car first, they would have discovered latent accident frame damage underneath, or maybe the transmission was about to go, or that the oil was burnt and the engine leaking. An hour or so of extra diligence could have saved many of these people. Lucky for me, a month into ownership of my Mercedes and for me everything was so far so good. Why didn't I run into trouble like others? The odds were in my favor to start with, since this was a thoroughly checked out car certified by a dealer with integrity that is a Better Business Bureau Accredited Business with an A+ rating, and I know and trust them. The dealer also showed me the VIN history report and disclosed that it has only a minor accident which I was willing to live with. Lastly, there is still time left on the manufacturer's warranty, so anything that breaks down in the next few months will be covered. Also my car being a JM Certified vehicle included a 90 day warranties from the dealer so my risk for out of pocket expense in the next few months is low. The finance manager went over financing options with me as well as extended warranty options, and warned me how expensive Mercedes is to repair, as he also owns one. He also reviewed a couple of financing scenarios, and I politely declined, stating I was paying cash and did not want to finance and did not want any extended warranties. So I never submitted to a credit application. I was pleased that this dealer did not try to pull the Patriot Act Scam on me, as other dealers sometimes do to buyers paying cash, where they force you to fill out a credit application, claiming it is required by federal Patriot Act laws, which is a total lie. I wanted to put the full purchase price of the car on my credit card to get the points, but their credit card merchant account only allows them $5000 max, which is what I did. I offered to go across the street to my bank for a cashier's check but they said it was not necessary, so I paid the rest with my personal check that they electronically processed and scanned right there and gave me my check back. When I got home and started to look through the owner's manuals, I discovered the original window sticker from my car was neatly folded up in between the books, and I was pleasantly surprised to get it, as many people don't save theirs, so it's an added bonus when you buy a used car that has one. But the real bonus for me came when I saw that the original window sticker price for this 3 year old Mercedes was $62,300 before tax, tag and title. What a shocker, and this is how you buy a Mercedes folks, at a 56% discount to the original selling price. Even I was surprised how much depreciation this premium model vehicle had suffered, but for once I was the beneficiary of steep depreciation. This is where a lot of people drop the ball. Too many people assume that they traded in the car so their name is no longer on the title, but that is incorrect thinking. Many car dealers typically don't take title to the car you trade in, your name stays on the title until they re-sell it on the lot or dump it at the wholesale auctions. Once they sell the car, they simply transfer the ownership on the title directly to the buyer. This is called Re-assignment by a licensed dealer. There is usually a field on the back of the title for this very scenario. What if someone messes up and fails to re-assign the title? Your name is still on it. I got online to the Florida DMV web site and downloaded the PDF form HSMV 82050, Notice of Sale and/or Bill of Sale for a Motor Vehicle. I filled it out, and took it directly to a local DMV revenue collector office and dropped it off. I made sure I got a receipt from the DMV for this form, and put it along with the title and other important papers in my new Mercedes Notebook which will also be used to store all my receipts and maintenance records going forward. A month after my purchase, life is good and the car is incredible and the honeymoon continues. My E-Class was in such good condition when I bought that our friends and neighbors all thought it was a new Mercedes, not a used one. I could not be happier and I got the steal of the century. Also, 2 days after I bought my car, JM Lexus switched over to a No-Haggle business model. They had given me a heads up about it while I was in there, citing AutoNation as their inspiration for doing it, so I was one of the last buyers to negotiate a lower price from them. Two weeks after my purchase, the title arrived in the mail, since I own the car with no car loan or lienholders. How is your hunt for a used car going? What issues are you seeing out there? Let us know in the comments below.